Bow Reharing? How To Take Care Of Violin Bow? Bow rehairing is the process which you replace the hair of your violin bow. Now, you may wonder why do you need to rehair your violin bow, when you can still use it to play with the violin? Here’s the answer. 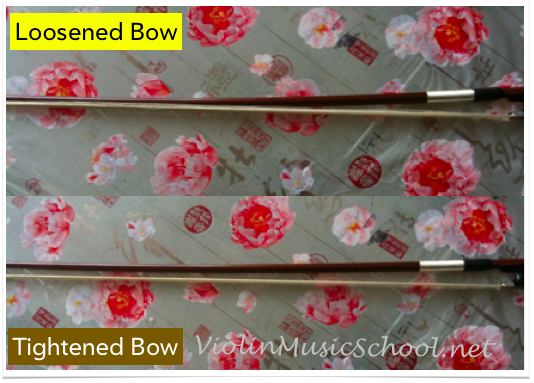 Our bow hair is made from white horse hair, and from our guide of choosing a good violin bow, we learn that a good bow hair will be able to cling on to the strings well, and vibrate along with it. However, due to wear, the hair may become ‘slippery’ , and unable to cling on to the strings. This is when you find your bow sliding on the strings, or you have to apply unnecessary pressure to your bow to produce the same sound. When your bow hair wears out, the hair is also unable to hold on to rosin which you allied on it. This is the time to go for bow rehairing! You can get your violin bow rehaired at violin shops who has professionals to help you with it. Bow Rehairing or New Bow? Now, you may ask the next question – why should I rehair my bow, if I can just get a new one? This is an interesting question, and was asked by many violinists. The truth is that most violinists will choose to rehair their bow, as it is just about replacing the old hair with a new one. However, if you’re getting a new bow, you will have to go thorough the process of choosing a new bow again, deciding various factors such as weight, wood, bow balance…etc. However, there are also violinists who chose to buy a new bow instead of rehairing, if the cost of rehairing is higher than the cost of a new bow. This usually applies to beginner and intermediate violinists who use inexpensive violin bows. Professional violinists play with the bows for long periods, and have an affection for them, hence bow rehairing would be a better option. How to take care of your bow? A point about bow rehairing is that you do not have to do it frequently, if you take good care of your bow and bow hair. Let’s recall. So how do you really care for you bow? Here’s 3 tips for you. 1. Loosen the bow when not in use. We tighten the bow when we are about to use them for playing, but we have to loosen them when we are not playing. When we tightened the bow, the bow hair is stretched to provide the tension to play with the violin strings. However, if we do not loosen our bow after playing, the hair will remain stretched, and you may have to tighten it further to get back the same tension for playing. The bow hair will be overstretched, and will wear in no time. We know that the rosin is applied onto the bow hair to increase friction for the hair to grip the violin strings. However, we do have to know that we have to use the correct violin rosin, and to apply sufficient rosin on the bow hair. Not too much or too little. Too much rosin will cause the hair to be ‘powdery‘ and too little will cause you to apply unnecessary pressure on the strings to produce the same sound. …the strings! Violinists, usually beginner violinists, will touch the hair near the bow frog with their fingers. Hence, you will see most of the hair aet thie bow frog are darkened, and can’t be used to played. The bow hair cannot come into contact with moisture, or it will darkened, and lose it’s ability to hold rosin, and thus unable to cling on to violin strings. Do note the way we hold our bow also. Our fingers should be at the bow frog and the wooden stick of the bow only, and not touch any bow hair. This will save you lots of money to rehair your bow. Have any questions regarding bow rehairing and how to take care of your bow? Leave them below!